Think the iPhone’s 3.5-inch screen is big? How about a handheld with a 100-inch screen? That’s the promise of Microvision’s PicoP laser projector. By bouncing pulse of red, green, and blue laser light of a vibrating mirror, the PicoP can paint WVGA (848x480-pixel) images up to 100-inches diagonal in a dark room—or about 12 inches under bright lights—on a wall, tabletop or any other surface. Measuring a scant 0.26 by 0.79 by 1.57 inches, the PicoP is about the size of the original cellphone cameras, and Microvision hopes to make it just as ubiquitous in cell phones and other handhelds. 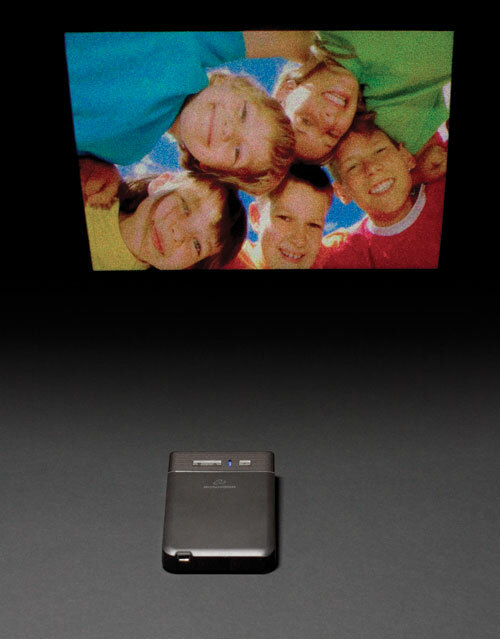 For starters, though, Microvision will bundle the PicoP with a battery in a separate handheld device, about the size of an iPod—called the SHOW, a prototype that the company debuted today. Microvision says it’s already inked deals with companies that will sell the SHOW under their own brands before year’s end. Prices aren’t set, but spokesman Matt Nichols says they could be made and sold profitably for under $500. You better check this one! Video is really worth seeing! Watch Shocking Laser Video... CLICK "NAME"
I recently came accross your blog and have been reading along. I thought I would leave my first comment. I dont know what to say except that I have enjoyed reading. Nice blog. I will keep visiting this blog very often. ahyana. I am so glad I was able to find your post. As you might imagine, I am scurrying around trying to find out all i can on this subject. Like many of the recent issue of pico projectors, it should be interesting to see just what the target market is. I will like it to see movies on a wall. And you can display it even in a corner without loosing the focus. This laser could be the next great thing of the future! Awesome stuff! Is it available to the public yet? I saw one at an expo show in Las Vegas, they are amazing and so tiny....But still expensive. Beats lugging around a large traditional projector though. At what expo? I was at Comdex and didnt see the little projector. I wish I had though. hmmmm......., just reread the article and it has no mention of the distance. I can imagine too far because of the size. Our story, it occurs only in youth that the most brilliant day. Le blog, ta mère ta belle mère et j’en passe, tu vas êt.